Disney cels and cartoon cels are featured in my personal tribute and celebration of the artistry of animation art. When I first began collecting and selling Disney Cels, Vintage Disney Animation Art Cels and Limited Edition Fossil Watches, Vintage Fossil Watches many years ago, I was initially attracted to the ability of these magical images to instantly transport me back to my childhood….oh, those wonderful Saturday morning memories! As my collection grew to what my fiance refers to as `excessive proportions’ (ergo the name ‘Celf-Centered’), I came to discover that animation ART is exactly that….art in its purest, most magical form. Far more than mere `cartoons’, these cels and drawings images showcase some of the finest artists anywhere. Not a day goes by that I don’t look at my cels – always with delight and child-like wonder. I know I’m not alone in my love of these wonderful images….so here’s my collection! I hope you enjoy them as much as I do! . CelfCentered Animation was first established in October 1994. CelfCentered Animation was first established in October 1994. Since that time, our animation gallery has evolved into an important source for collectors of Disney animation cels, Disney original drawings and collectible fossil watches. Our goal is to provide animation art collectors with the highest quality art work available at the lowest possible price. No matter what your collecting style or whether you’re a professional collector or a beginner, CelfCentered provides you with the quality service you deserve. 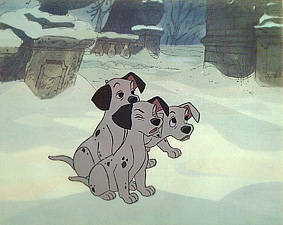 We are sellers of disney cels and vintage disney animation art and cels. visit Celfcentered.com for animation art and comic cels or cells. We have Disney production cells, limited edition cells, posters and collectible fossil watches for sale. Our website is designed for serious buyers and sellers of Walt Disney animation cels (cells), original animation drawings, cartoon cels, original Disney lobby cards, posters and fossil watches. If you are an animation art collector, CelfCentered is the best online website to buy a cel or sell animation cels online. Enjoy browsing the CelfCentered animation art gallery cels and drawings for sale and view the consignment art for sale, cels for sale and animation cels for sale or consignment. Collectors ask – Where should I buy animation art cels/drawings online? Where do I sell my animation cels/drawings online? How much is my cel/drawing worth? CelfCentered is designed to appraise your cels/drawings or sell your Disney animation cels, toys and drawings online. No fuss no muss!